Walmart filed its latest quarterly report last Thursday, and compliance officers know what that means: another update on the company’s long-running FCPA investigation. This quarter’s tally was $29 million. Of that amount, $24 million related to the ongoing investigation, another $5 million devoted to “global compliance and organizational improvements.” For the first three quarters of this year (Walmart’s fiscal year starts on Feb. 1, so it is already three-quarters through fiscal 2017) the grand total is $82 million. We all know the history here. On April 21, 2012, the New York Times published a front-page article alleging widespread violations of the Foreign Corrupt Practices Act at Walmart’s operations in Mexico. In truth, Walmart had already reported potential FCPA trouble to the Justice Department and Securities & Exchange Commission in late 2011, but the New York Times coverage (which netted the reporters a Pulitzer Prize later that year) prompted the Justice Department to launch a probe of its own. Those probes quickly expanded to include Walmart operations in other parts of Latin America, as well as India and China. They continue to this day, in a very public spotlight. So how much has all this cost Walmart? I decided to look at the filings. 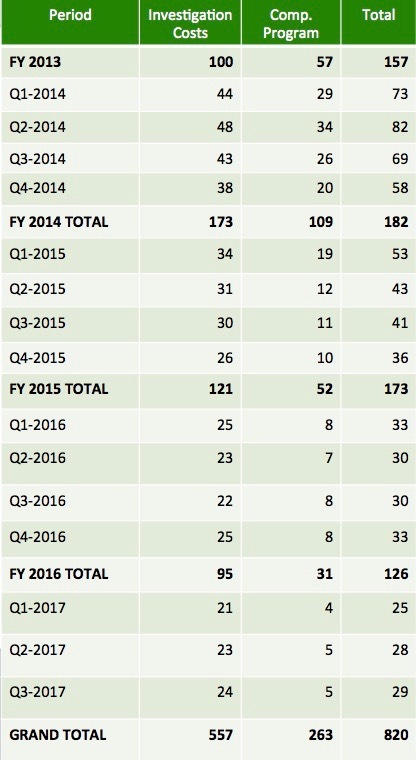 Walmart disclosed $157 million in FCPA costs in its 2013 fiscal year, which covered the 2012 calendar year when its troubles first emerged. At the time, Walmart did not track those expenses quarterly, nor did it split them into separate line items for the investigation itself and for compliance program improvements. Of course, that tabular format is too difficult to read. 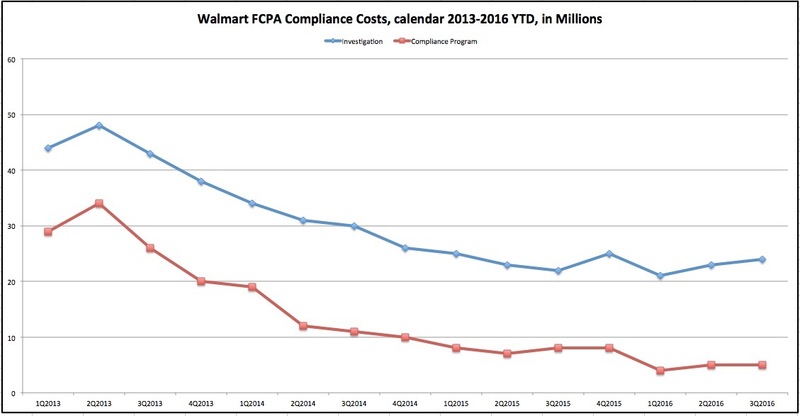 When you plot that spending on a graph, however, you can see that Walmart’s FCPA spending started big in calendar 2013 and quickly tapered down. (2012 spending is omitted because Walmart did not report those costs quarterly.) See below. None of that should surprise people who have followed Walmart’s FCPA saga closely. The investigation began amid fierce scrutiny, with implications in the New York Times articles that Walmart bribed practically every Mexican official it could find. Over time, however, the worst allegations fizzled. By late 2015 the big headlines were about the lack of widespread bribery at Walmart, and how the investigation might end without criminal charges or large penalties. We should also add that early in this drama, Walmart hired Jay Jorgensen as its global compliance chief, who has worked admirably to reform and strengthen a program that cannot be easy to oversee under the best of circumstances. (Walmart has 2.2 million employees and nearly half a trillion dollars in annual revenue, after all.) The numbers suggest that Jorgensen spent big in the early years and now has a much more mature program rolling along. Walmart rebuffed prosecutors earlier this fall, who had proposed a $600 million settlement to all Walmart’s FCPA troubles. Perhaps we can’t blame company executives for that resistance. Early reports of misconduct, now nearly five years old, may have been much worse than was actually the case. Plus, the Trump Administration takes office next month. Walmart’s lawyers can stall for time and then reach a final settlement with new Justice Department leaders, who might be more open to less punishment. We don’t know exactly how Attorney General-to-be Jeff Sessions views deferred-prosecution agreements and large corporate penalties, although he frowned on them during his time in the Senate. My guess is that Sessions will be much more open to giving cooperation credit for companies that demonstrate good-faith efforts to find facts and remedy problems—and Walmart can show 820 million examples of the effort it has made so far. Maybe, just maybe, we might see the end of this saga sometime soon.